George Aitchison the cabinet maker's eldest son, John was born in St Pancras in 1821. By 1841 he had established a small pianoforte making business with his brother George and was living in the Aitchison family home at 5 Princes Street. John married in 1850 (see certificate above). His wife was a widow named Ellen Isaacs whose husband Isaac Isaacs had recently died in 1849. Ellen's maiden name was Ellen Ball and her father had a successful Undertakers business. When she married Isaac in 1838 they started an undertakers business in St Pancras, and by 1846 had established premises at 43 Henry street, off Hampstead Road. After Isaac Isaac's death his widow married John Aitchison and the couple lived with Ellen's three children at Henry street. John changed his occupation to being an undertaker around this time. 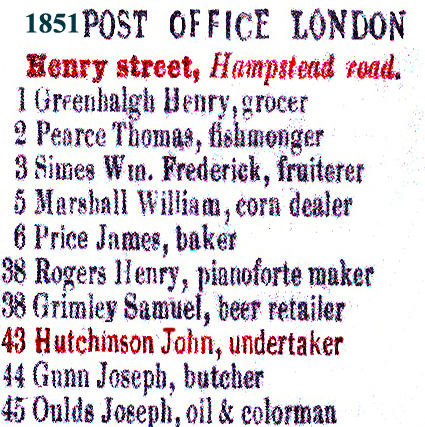 Some of the difficulties in reseaching family histories are shown in the 1851 Directory listing (shown left) John Aitchison Undertaker of 43 Henry Street Hampstead Road St Pancras is incorrectly shown as John Hutchinson. John Aitchison's relationship to George Musgrove was that he was his uncle. The 1851 Census shown below has John Aitchison's family listed at 43 Henry Street. When he married Ellen Isaacs she already 3 children from her first marriage. James, Jane and Ellen. The 1870 map below shows Henry Street at that time. The area was developed in the 1960's.